Johnson Beach is located on the eastern end of Perdido Key. Named for Rosamond Johnson, Jr., a man of courage, valor and honor, was killed on July 26, 1950 during the Korean War. Army Private Rosamond Johnson, Jr. was the first Escambia County resident to die in the Korean War on July 26, 1950. He had successfully carried two wounded soldiers to safety and was returning with a third when he was fatally wounded. He joined the military at age 15 and died at 17. He posthumously received the Purple Heart August 21, 1950 and several veteran groups are still working to seek additional military honors for this deserving hero. The Sunset Riding Club, Inc. club leased the land in 1950 from the county for the sole use of bathing, beach and recreational facilities for "colored citizens." Although the lease was cancelled, in 1956 the name Rosamond Johnson Beach remained. The area became part of Gulf Islands National Seashore May 8, 1973. 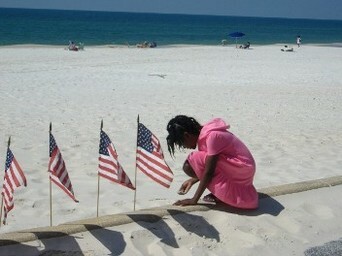 A permanent monument in Johnson's honor was erected at Johnson Beach on June 10, 1996. Front Gate 850-492-7278. Johnson Beach, (850) 934-2600. Fort Barrancas was built on the site of numerous previous forts, including, Fort San Carlos de Austria, built in 1698 and destroyed in 1719. The site was used as a harbor fortification by the British and the Spanish captured Pensacola in 1781 and completed the fort. The fort was constructed mostly with skilled slave labor whose craftsmanship is admired by all visitors. Scheduled tours of Fort Barrancas are daily at 2:00 p.m. and at the Advanced Redoubt every Saturday at 11:00 a.m. Fort Barrancas and the visitor center is open March-October at 9:30 a.m. to 4:45 p.m. and November-February at 8:30 a.m. to 3:45 p.m. Please call 850-455-5167 for more information. Fort San Carlos de Austria. In 1698, Spanish explorer, Admiral Andres de Arriolla, made a permanent settlement on what is now Pensacola Naval Air Station. This group included both slaves and free persons of African descent who helped build a key part of the settlement. The area has been used as a burial ground since the construction of Fort Barrancas. In 1838 it was established as a United States Navy cemetery. During the Civil War, Pensacola was hotly contested, as it was considered to be the best port for access to the Gulf of Mexico. Numerous soldiers on both sides were interred in the cemetery after falling in combat, or dying in nearby hospitals. Records indicate the following information on the burial of U.S. Colored Troops -- known: 154, unknown: 98. After the war, in 1868, Barrancas was officially made a National Cemetery and many others nearby makeshift burial grounds were disinterred and relocated to Barrancas. The church was officially founded in 1852, although members say it began earlier as a nondenominational church. It has always been in the Warrington area. Its original location was at Barrancas Avenue and Gulf Beach Highway. Church maintains a small history museum in fellowship hall. The church was organized on December, 11, 1933 by a small group of women, several of whom were descendents of black land owners and residents on the land now occupied by Naval Air Station Pensacola. Church services were originally held in a “Bush Arbor”, a shelter made of cane poles and leaves on the corner of Harris Street and Gulf Beach Highway. First service was held on the first Sunday in January 1934. The Bush Arbor served as the church building until October 1934. A photograph of the Bush Arbor, dated October 21, 1934 can be seen on a commemorative plaque located on the cornerstone of the church’s fellowship hall. The Martin Luther King, Jr. Plaza is located on median at Palafox and Garden streets. The plaza commemorates the contributions of Dr. King and is the perfect centerpiece downtown, whether for the summer farmer’s market, to watch various parades or just to take a moment to reflect. St. Joseph’s Catholic Church is located 140 W. Government Street. St. Joseph was created in 1891 for the exclusive use of Creoles and blacks in Pensacola. The St. Michael’s Creole Benevolent Association Meeting Hall is located at 416 East Government Street. This house was a late 1800’s gathering place for Pensacola Creoles, who were descendants of African, Indian, French and Spanish settlers. St. Michael’s Cemetery address is 6 N. Alcaniz Street. The phone number is (850) 436-4643. The cemetery is reported to have been a burial site since the mid-1700’s. St. Michael’s is one of the only cemeteries in the country that has both nobility and slaves buried side by side. Conk shells next to tombstones indicate a minority burial site. The Blue Dot Barbecue is located at 310 N. DeVilliers Street, (850) 432-0644. This legendary, no-frills burger joint offers one of the best hamburgers in the region. Their hamburgers are routinely voted as the best hamburger in Pensacola. The restaurant is nationally acclaimed and has been written about in various publications, including ‘Southern Living Magazine’. The restaurant has been located in the historic neighborhood for nearly seventy years. 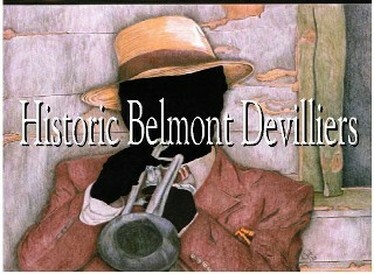 The Belmont DeVilliers neighborhood was a Melting Pot for music, food and entertainment during the early 20th century. The district currently is undergoing revitalization. The Gumbo Gallery is a cultural heritage tourism attraction that is located at 314 N. De Villiers Street. 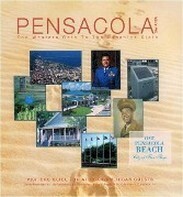 Gumbo Gallery is the leading gallery in preserving the culture and history of the "Forgotten Communities" of Pensacola. Don’t miss this delightful gallery of eclectic multi-cultural art from Artist/Owner Sonja Griffin Evans and other colorful local artists. A must see location for all tourists. Phone: 850-912-6806. The Historic Bunny Club, located at 500 W. Belmont Street is the last standing “Chitterlin’ Circuit” era entertainment club remaining in the Historic Belmont De Villiers community and Pensacola. St. Cyprian’s Episcopal Church, 500 N. Reus St. Founded in 1887, the church was formed as a mission church through the sponsorship of Christ Church. Zion Talbot Chapel, 525 W. Jackson St. Founded in 1880, the original building was destroyed by fire. The present building, constructed in 1918, houses one of the first pipe organs found in Pensacola. Julee Panton Cottage, 210 E. Zaragoza, (850) 595-5985. 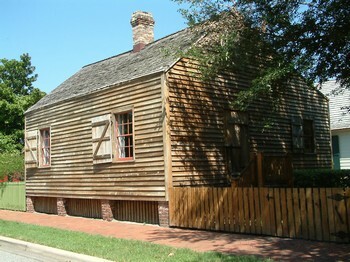 Named for a free African-American resident who lived in the house in 1803, the Julee Panton Cottage is now part of Historic Pensacola Village. The middle-class home is open for tours, complete with a furnished parlor, bedroom and kitchen. this church was built by slave labor in 1824. It’s the oldest church in Florida still on its original site. 200 E. Church St. The organization, housed in the Kate Coulson House, promotes preserves and integrates African- American heritage and culture. The house includes an art gallery, gift shop and resource center. St. John the Baptist Church is located at 101 N. 10th Avenue. Founded in 1847, it’s the first black church in Pensacola. Most African American Baptist churches in the Pensacola region were created out of the membership of Historic St. John the Baptist Church. Allen Chapel AME Church, 500 N. Guillemard St. 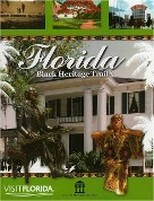 Organized in 1866 by Henry Call who began the AME denomination in Florida. Initially, the church was a secret organization until he realized slaves were really free. H&O Restaurant 301 E. Gonzalez, (850) 432-1991. This restaurant has served traditional Southern dishes since the 1930s and was a focal point for the black community before integration. Wealthy businessman Tierce Lee and wife Hattie were the original owners of this property, in partnership with brother Hamp and wife Ola. The restaurant became famous hot spot during the ownership of the Grier family. had a private school for black children in the house, where a large majority of black professionals obtained their education. 900 North Hayne Street. John Sunday was an African American Civil War soldier and Florida State Legislator during Reconstruction. A wealthy entrepreneur, who is credited with leading the business development in Historic Belmont De Villiers. Two still standing building constructed by John Sunday are the old Historic Bunny Club and Gussies Record, located at the corner of Belmont and De Villiers streets. 407 East Gonzalez Street; Dr. Pickens was an African American pharmacist, physician and coroner. Known for his love of community and support of its people in the community. 601 E. Jordan Street, A physician trained Meharry Medical School and the University of Leon in France during World War I. Noted as a medical pioneer in Pensacola. 501 East Jordan Street. A landmark that represents a fond cultural period in Pensacola’s history. Listed on the National Register of Historic Places. 2005 North 6th Avenue. Named after Pensacola’s first black Supervisor of Colored Schools. 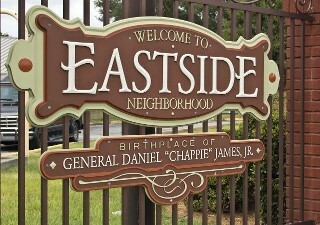 He petitioned the school to construct a school of the eastside, so students would not be required to walk to a school on the Westside of Pensacola to be educated. 2400 Dr. Martin Luther King, Jr. Drive. A local physician and pharmacist, who was recognized for his surgical skills. 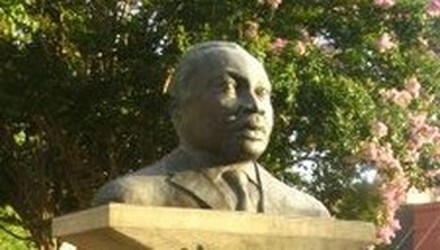 I-110 Interstate Corridor (East Blount and Haynes Street) is named after the first Black person elected to a public office in Pensacola during the last century. I-110 Interstate Corridor (East Jordan and Haynes Street). A section of the city that is affectionately called the ‘Lost Community’. The Lost Community was demolished in preparation for the construction of Interstate -110. 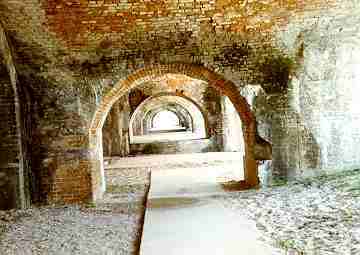 Fort Pickens is located on the western portion of Pensacola Beach, (850) 934-2600. Because Pensacola had relatively little agriculture, slaves did not have traditional Southern plantation experiences. Instead, West Florida slave owners rented out their slaves to work in construction trades or as longshoremen on the waterfront. For example, the U.S. Army rented slaves to build forts such as the 19th century masonry walls and earthworks at Fort Pickens. During the Civil War, African-American troops occupied Fort Pickens while Confederate troops held Fort Barrancas on Santa Rosa Island. Century is a small town in Escambia County, north of Pensacola that was once known as Teaspoon before the American Revolution. 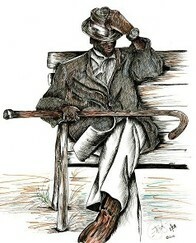 Teaspoon was a settlement of free African Americans, who traded on the old Conecuh River. The community is located on Highway 29, near Interstate 65. Learn about the history of Teaspoon and how it affected blacks and slaves, and about the old sawmill in the community museum. The society is located on Fourth Street at Houston Park, in the City of Century, Florida. Call 850) 256-2029, (850) 256-3980 for more information.